Self help Techniques For Understanding Parallel Realities! Of Parallel Realities - Part 1 Time And Space! This inspired self help techniques page serves as an introduction and a guide to the idea of parallel realities. It’s far from a conclusive guide, although I do believe that by understanding the basic nature of parallel realities you’ll be inspired to choose to only focus upon the kind of world you prefer to exist within and to ignore all other parallel reality choices that are available to you. This knowledge has been intentionally hidden from us for the purpose of limiting our personal power! However, by remembering this long forgotten knowledge, when an unwanted or negative future reality seems like it’s the only choice available you’ll remind yourself that it isn’t. All probable versions of reality are equally valid choices within the idea of Now and once you know you have a choice then you get to decide which reality you prefer to experience! This Reality Change guide includes practical ways by which you’ll be reminded of what to focus upon and how to avoid the pitfalls. By understanding and utilizing the information outlined by these inspired self help techniques you’ll be fully self-empowered to make choices that serve you best! You’ll know you always have a choice and thus you’ll be better prepared not to buy into any particular reality, just because your ego self personality construct says is the only choice. To understand the nature of parallel realities it’s helpful to understand the nature of time. Psychologically you hold time in memory as the so-called past and project ideas into the so-called future, but neither of these psychological states of past or future is actually real, the only real time is the present moment or Now! Even when you think about the past and future you do it in the present moment because there’s nothing outside of Now! The truth is that the actual past and the actual future all exist simultaneously within the present moment of Now. And what you perceive as past and future is actually the same Now moment viewed from a different perspective that’s created within your own consciousness.This inspired psychological self help page goes deeper. So the idea of linear time doesn’t have an objective reality per se, that’s why time is simply an idea. That is to say, time is a social convention that we agree upon and use for convenience. To really get this you have to realize that in this particular reality you have been conditioned to believe that time is something objectively real, when in truth it isn’t! Further, it’s impossible to discuss time without considering the idea of space. You see, if you say I traveled from location A to location B then, by definition, you traveled through space. So in that sense the ideas of time and space are inseparable – like two sides of the same coin. Furthermore, what we generally refer to as 3D reality is actually 4D reality because we have 3 dimensions of space and 1 dimension of time. Considering the actual fact that time is merely a social convention or an illusion, this means that all possible realities within creation are fixed and unchanging throughout eternity. That is to say, with "time" removed from the equation we’re left with infinite unchanging reflections of reality within the idea of All That Is. Therefore, every time you perceive reality you’re looking at a fixed and unchanging snapshot of creation from your unique perspective or point of view. Of course, you can and do perceive the idea of movement and change as you shift through the individual still images of reality infinite times per second, but that’s only your experience - it’s not the actual nature and structure of existence. That is to say, what you perceive as linear time or movement is actually your consciousness sifting through similar yet discrete parallel reality reflections which causes the side effect called "time." The image above indicates the frozen snapshots of reality. As your consciousness shifts through these unchanging snapshots, from your physical perspective, you perceive movement and change. 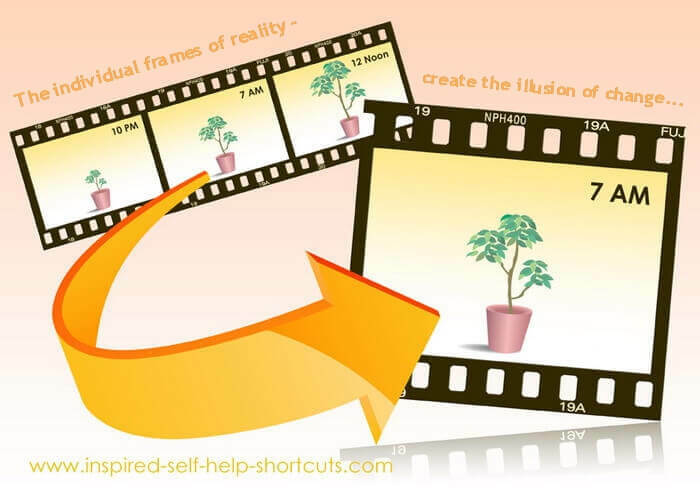 So while you may see that your plant has indeed grown overnight that's not actually what has happened, that's not the mechanics of how reality works. The plant you see at 10pm, 7am and 12 noon are 100% different parallel reflections of reality. Inspired Self Help Techniques – What Changes? While it’s generally understood that change is a constant of life, what’s generally misunderstood is what actually changes. While it’s true that you perceive constant change all around you, no actual change in external reality takes place. That’s right, reality consists of infinite stagnant unchanging frames of reality, and so what actually changes is your perception as your consciousness moves through and filters these fixed and unchanging images of reality. To really get this you have to continually remember (re-mind yourself) that any form of linearity is illusion, thus there’s no "real time" and no "real space" other than Here and Now in which any perceived external change can take place! That is to say, there is "no outside" of your own consciousness, everything takes place within it! Realize that you are already shifting between infinite versions of parallel realities each second, that's how experience of time, movement and change really occurs. So in that sense there's nothing extra that you have to do because you're already doing it. This is not hard it's simply a matter of learning "how" you’re already shifting and utilizing that knowledge to better serve you. The masses don't know this on a conscious level because they've been conditioned not to use their personal power, so let's help to break that mold by being an example! The nature of existence is vibrational and the only thing that separates any reality from any other reality is its discrete vibrational frequency. We already indicated the linear time is illusion so, obviously, all possible realities exist Here and Now – because there isn’t anywhere else. Thus, each version of reality exists simultaneously in parallel to every other version of reality, each separated only by its discrete vibrational frequency. You are also a vibrational being and the only version of reality you can possibly perceive and experience is any reality you key into with your frequency. Your vibrational frequency is determined by your state of being. The emotions of fear and love are actually what determine the kind of reality you’ll experience by activating them – your emotions in turn are governed by your thoughts and beliefs. For instance: if you believe in and imagine a version of reality in which the negative elite aka the deep state have taken full control, and you live in sustained fear of that, then sooner or later that idea of reality will manifest as your reality. Conversely, if you believe in and imagine a world in which everyone does whatever they do with passion and love, and you offer sustained good feelings about that, then that reality must ultimately come to pass as your reality. Again, understand that time and space are illusions thus all probable and possible realities are available to you right Here and right Now. Although in order for you to experience any particular parallel reality you must first adjust your vibrational frequency, by changing your beliefs, in order to match the vibrational frequency of that parallel reality and tune into it, thereby making it visible to you. Remember that there’s no reality available for you to perceive and experience other than any reality that you’ve defined, believe in and imagine to be true. So in that sense any reality that you choose is an illusion, but you’re free to choose to experience any of an infinite number of probable illusory parallel realities that fit your preference – and this is determined by your vibrational state of being. That’s why it pays not to look where you don’t want to go. Simply observe and acknowledge all possible reflections of reality that come into your awareness, but only pay attention to and focus upon those that fit your preference and feel good to you. The next section goes into practical ways in which you can navigate to the parallel reality of your choice. If ever I'm driving my car and I (my ego) realize that I'll be late for an appointment due to road works or other traffic issues, rather than focusing upon the parallel reality I don't want - being late, I purposely ignore the fact that's right before my eyes and continue to focus upon arriving on time. This act is consciously choosing your preferred reality by focusing upon it and not upon an unwanted reality. What happens is that I generally arrive on time or perhaps a few minutes late, but that's never a deal breaker. It's important not to keep looking at a clock or watch as that might create anxiety and it will reinforce the idea that you'll be late. In addition, by staying focused upon the parallel reality you desire and by relaxing, you are opening yourself to guidance from your higher self. 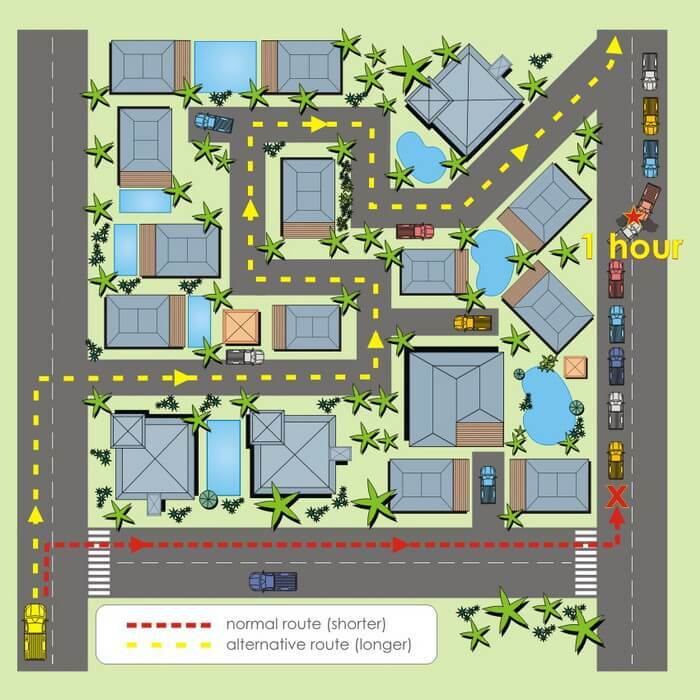 Study the image above and look at the route of the yellow vehicle. By allowing guidance from your higher self you may be directed to use a different route to one you usually take. This guidance may come as an image in your mind or as a strong emotional feeling - pay attention and don't doubt! Whenever I find myself in a situation whereby I have cash flow issues, my (ego's) first thought is something like: oh no, I'll have to use all of my savings or oh no, I'll run out of money. Again, this is consciously choosing to pay attention to and to focus upon a parallel reality reflection that I don't prefer. In other words, I'm projecting a fictional idea into the future that's based either upon fear or upon past experience. At this point due to my knowledge, my beliefs and my experience I remind myself that I (my ego) cannot see what’s ahead and so I don't really know how it will turn out, so I'm guessing. And so I simply focus upon the desired parallel reality in which money will arrive in perfect timing. Then I relax and continue to go about my day in a cheerful manner while remaining vigilant for inspiration and signs from my higher self and I always act upon any guidance received! Several years ago I had quite a lot of conflict with a business colleague. We did not see eye to eye on how to best run the business and this resulted in quite a lot of fairly negative two-way email exchanges. After this had been ongoing for several months I got a series of abscesses on my backside which forced me to pay attention. Being someone who always wants to get to the root of any issue I consulted a book that I keep on hand for health related issues. Fermenting thoughts over hurts, slights, and revenge. Immediately I knew that the cause was spot on, so I printed out the new thought pattern and stuck it on my desk in plain sight in order to remind myself to change my thinking about my colleague. Thus, from that moment onward I decided and I chose not to indulge in any more conflict with them. Instead I kept all of my emails general and even when there was an invitation for conflict I refrained from entering into it. In addition, I ended every email with a smiley face. Within a few days of maintaining this new viewpoint and vibrational state of being the abscess on my backside was gone and has never returned. On a deeper lever I consciously chose to shift from a parallel reality in which I experienced conflict and pain into a parallel reality of peace and harmony with no pain attached! 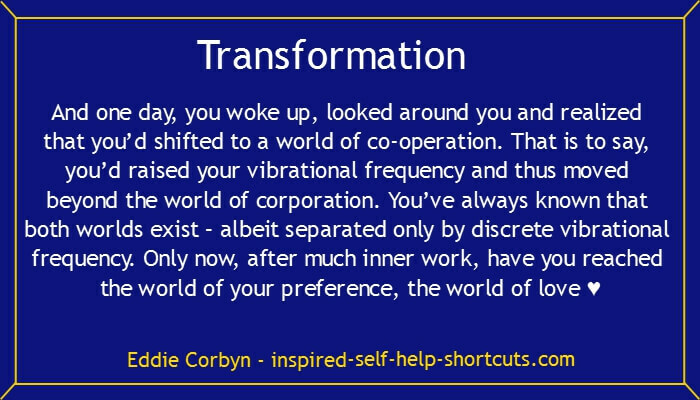 This inspired self help techniques info advises you to remember that each person reflected to you in your reality is "your version" of them, thus in order for them to change you must first "change your mind." The reflection of a mirror cannot and so will not change unless and until you change! This inspired self help techniques image reminds you that every parallel reality is available to you! In this particular parallel reality timeline we're conditioned from birth to buy into certain ideas and we’re trained to believe many things as if they are real, without realizing they are merely beliefs. Due to this fact we all pick up a lot of fear and this is what might show up when you decide and choose to go against the so-called norm and step into your personal power. Desire: You want to change your experience so that there's always a parking space available for you, instead of always having difficulty finding one. Your ego complains: Don't waste your time! There are only so many spaces available and getting one depends upon luck! Cause: You don't really believe in the idea that there are infinite probable realities available at any given moment. Solution: Do more research into the idea that "time" is an illusion. This will lead you to the understanding that "all possible" parallel realities exist simultaneously Here and Now. Desire: You want to change your life by shifting into a parallel reality in which you experience more financial abundance. Your ego complains: This stuff is nonsense! In order to be more abundant you need to work harder! Cause: You don't really believe that you can change reality by changing your mind. Solution: Do more research into the nature of vibration and resonance aka the law of attraction. This will lead you to the knowledge that "like attracts like" and "what you put out (vibrationally) is what you get back." Desire: You want to change your life into one where you experience more harmonious relationships with others. Your ego complains: Don't be daft! The only one who can change that person is that person! Cause: You don't really believe that you are alone (all one) in your Uni-Verse. Solution: Do more research into the idea of Oneness. This will lead you to the truth that each "apparent other" is indeed a reflection of who you are being in this moment. If you're confident that you are doing all that's needed in order for you to experience the kind of parallel reality you prefer to exist within, but you're not seeing the desired results it's probably due to timing. In this case it's best to simply relax and enjoy your life and don't start doubting. Remember: the external reality can only change once you're really changed and so by allowing your mind to continually swing to and fro between belief and doubt will cause delay. In addition to what's already been said on this inspired self help techniques page, I suggest searching through other areas of this website, browsing other relevant websites, studying material or reading books by authors such as those indicated in quotes on most pages of this website. In closing I'll just say that we chose to incarnate into this particular reality. And while I don’t confess to know 100% why and what we came to do here, I do believe that it has a lot to do with raising our vibrational frequency and by so doing we're bringing more light into this relatively dark parallel reality reflection of All That Is. I trust that this inspired self help techniques page assists you to raise your vibrational frequency in some way. That covers the basics of this inspired self help techniques - introduction to parallel realities part 1 time and space. If this information resonates with you, please read part 2 health and well-being on this advanced self help health page.